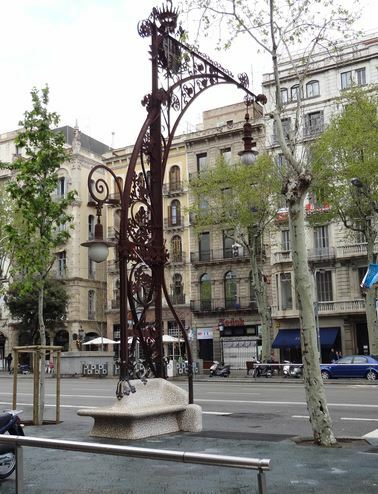 The Paseo de Gracia is not just a choice location to see Gaudi Works in Barcelona, as it is also one of the first streets in the Ensanche; in fact, its layout has a slight angle when compared with the general grid, which follows the straight line of the Gran Vía, defined by distant points. It is a boulevard with a central main way, lateral planted alleys and side service traffic alleys. With an overall width of 60 m, the central way is 22 m, and the sidewalks of the buildings are in some places 9 m wide. It is one of the prime retail locations in the city. 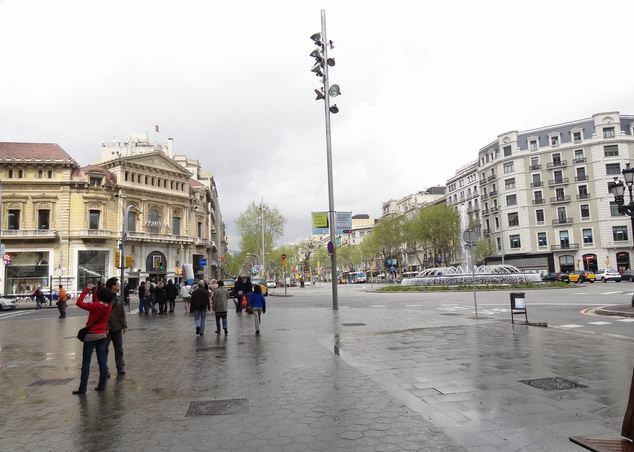 The intersection with the Gran Vía de les Corts Catalanes. The urban furniture is quite simple in this busy crossing. Urban furniture in the most Gaudi-esque section of the street.